Politics is hampering Hanoi’s ability to respond. China’s recently revealed massive land reclamation activities in the South China Sea represent a particular threat to rival claimant Vietnam’s strategic position and interests. Factional competition ahead of next year’s Communist Party National Congress, where five-year plans, policies, and leadership positions are determined, has complicated Hanoi’s ability to devise a coherent and credible response to the maritime area’s increasingly complex geopolitics. 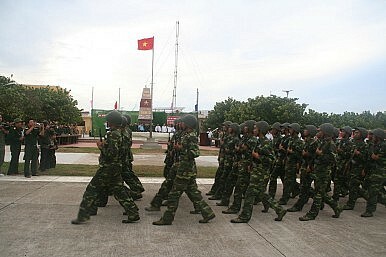 Although largely geared for anti-ship operations, Vietnam’s navy and air force are already severely outgunned and outnumbered by China’s People’s Liberation Army. Those qualitative and quantitative differences have widened in recent years as China has bolstered its naval capacities and reach, and Vietnam has scrambled to procure and integrate enough vessels, mainly Russian submarines, to create a credible deterrent force. A Chinese fighter jet presence in the Spratly islands, if realized, would significantly boost Beijing’s power projection capabilities and further tilt the maritime area’s strategic balance in its favor. In particular, a Chinese air force presence would provide a new, proximal platform to target Vietnam’s naval-controlled shore-based artillery and missile systems, viewed by many strategic analysts as Hanoi’s strongest deterrent to a potential Chinese attack. Led by two-term Prime Minister Nguyen Tan Dung and viewed generally as “reformist,” one Party faction has bid to counter China’s rising threat by bolstering strategic ties to the United States. Defense Secretary Ashton Carter’s early June visit to Vietnam symbolically advanced that trend, with both countries’ military chiefs agreeing to a “joint vision statement” that aims broadly, if not vaguely, at deepening defense relations over the next 20 years. Carter was the first American defense chief to visit a Vietnamese military base and tour a Vietnamese coast guard vessel, a U.S. Defense Department statement said. Building on U.S.-Vietnamese naval exercises earlier this year in Danang, where the two sides practiced using code for “unplanned encounters at sea,” Carter said the U.S. would provide $18 million for Vietnam’s Coast Guard to purchase American patrol vessels. Last October, the U.S. eased but did not lift a long-held ban on the sale of “lethal” arms to Vietnam imposed in response to its poor rights record. Days after Carter’s visit, reports emerged that Vietnam is in talks with European and U.S. contractors to purchase jets, patrol planes and armed drones, procurements that would significantly upgrade its air defenses in the South China Sea and lessen Hanoi’s reliance on Russia for arms at a time Moscow and Beijing draw closer. The reports said Vietnam was in discussions with Sweden’s Saab, European multinational Eurofighter, the defense wing of France’s Airbus, and U.S. defense giants Lockheed Martin and Boeing. They did not indicate which companies where in talks for which armaments. While Dung’s faction has reached to Washington, a rival conservative faction led by President Truong Tan Sang and Party General Secretary Nguyen Phu Trong is viewed as ideologically tied to China. In April, Trong and Chinese President Xi Jinping agreed at a meeting in Beijing to control their maritime disputes, bolster strategic ties and consider joint development initiatives in the South China Sea. Sang sounded similarly conciliatory notes on the maritime disputes after meeting Xi on the sidelines of last November’s Asia-Pacific Economic Cooperation (APEC) Forum hosted by Beijing. Sang and Trong were seen as instrumental in smoothing relations with Beijing after deadly anti-China riots in May 2014 drove hundreds of Chinese nationals out of Vietnam. Dung, on the other hand, sounded strong nationalistic notes in the run-up to the riots, which were sparked by China’s placement of an oil exploration rig in waters claimed by Vietnam. Analysts and diplomats still wonder whether the riots, which destroyed several foreign-owned factories, including 14 owned by mainland Chinese investors, erupted organically or had hidden official backing. If Dung’s faction secures the Party’s top posts, including prime minister, president, National Assembly chair and general secretary, at next year’s National Congress, some analysts believe a more unified leadership would pursue even stronger strategic ties to the U.S. and a bolder stance against China. Should the China-leaning faction prevail, the same analysts expect a slowdown or rollback of engagement with the U.S. and more conciliation towards China. Until the leadership transition is decided, factional infighting and policy indecision will hamstring Vietnam’s ability to counter quickly and coherently China’s game-changing maneuvers in the South China Sea. Domestic politics flared up into an international dispute between Vietnam and Germany.